Hypothyroidism is a dangerous condition that should be taken seriously. It can have a major impact on every aspect of your life; however, controlling your diet can help you curtail the effects of the condition. This article will inform you on what hypothyroidism is, how it affects the body, and ways to help control its affects through diet. Hypothyroidism is due to an abnormally low production of thyroid hormone by the thyroid gland which is controlled by the pituitary gland. The low levels of thyroid hormone are known to affect cellular processes and metabolism and growth and development. The thyroid creates its hormones from the amounts of iodine in food and released when triggered by the pituitary gland. Hypothyroidism is rather common and is often caused by medication, low iodine levels, a malfunctioning thyroid or pituitary gland, radiation, or associated with another disease such as Lymphocytic thyroiditis and Hashimoto’s thyroiditis. The symptoms of the disorder may manifest in different ways depending on the age of the patient. If it occurs in foetuses then there will be severe and irreversible developmental changes in the body and the brain. In children, hypothyroidism may cause changes in intellectual development and delay sexual development. In adults, hypothyroidism is manifested through some characteristic symptoms: Dry skin and thinning hair, chronic physical fatigue and muscle weakness (due to the fact that this disorder results in a reduction of protein synthesis), swollen eyelids, swollen tongue and swollen face in general. Intolerance to low temperatures happens because hypothyroidism decreases the thyroid hormones and slows down metabolism and oxygen consumption. Lethargy, depression and feeling of fatigue are also its symptoms. Other symptoms include: constipation, weight gain, anaemia, low tone of voice, loss of hearing and memory, decreased fertility, heavy menstrual flow, cramps, slow heart beats and increased levels of low density lipoprotein (LDL) and triglycerides. At its early stages this thyroid disease, may progress very slow and the patient may not even realise that he suffers from the disorder. The condition can be caused by autoimmune thyroid disease or due to iatrogenic factors (like the abuse of certain drugs) or by a serious deficiency of iodine in the diet. Iodine is a mineral essential for normal thyroid function, and if there is insufficient iodine in the body, the gland cannot synthesize thyroid hormones. Fortunately the body has good reserves of iodine (enough for about 60-90 days) and the mere consumption of iodized salt can avert the risk of these specific deficiencies. However, there are some areas of the globe where the chronic lack of iodine causes hypothyroidism. Individuals with hypothyroidism can have devastating effects on the human body and as the disease furthers without treatment the signs and symptoms worsen. Hypothyroidism can affect just about every part of the human body; here are a few examples: can cause thinning and change the texture of your hair, dehydrate your skin, puffy eyes and face, cause constipation, inability to tolerate colder temperatures, fatigue and sleepiness, depression, leg swelling and all around aches and pain, increased cholesterol levels, and weight gain due to a slow metabolism. Know that if the condition is not properly treated coma and death can result. Although hypothyroidism can be treated, areas that will more difficult to regain control of would include weight gain. Medication can control the effects of hypothyroidism rather quickly but there will still be the issues of the weight that was gained while the condition was out of control. It’s imperative that weight gain is controlled to better the condition; diet and exercise can help. Your diet directly affects hyperthyroidism and therefore must be addressed and controlled. As with just about any medical condition there are foods that help and hinder. Now, you will still need to exercise with dealing with hypothyroidism. Remember, exercise increases your metabolism, helps you lose weight, makes you feel healthier, lessens stress levels, and makes your body function better. To better control hypothyroidism via diet, increase foods that have high doses of tyrosine such as lima beans, pumpkin and sesame seeds, fish and lean meat, poultry, bananas, lentils, avocados, low-fat milk and yogurt, spinach and carrots. Each of these foods will help increase your thyroid production and will help your thyroid function better. Now, these may not be your favourite foods, but you can get them past your lips to better the quality of your life. Now, if there is a ying then there is a yang; thus, to control your hypothyroidism you will have to avoid some foods as well – even if they are your favourites. Remember, the goal is to control hypothyroidism and to better your quality of life. Avoid spinach, tofu, soy beans, strawberries, radishes, peaches, broccoli and cauliflower, turnips, peanuts, and everyone’s beloved carbohydrates which will increase insulin levels and lead your body to resist weight loss. As few other tips for dealing with hypothyroidism and diet: avoid stimulants like coffee, soda, and alcohol and control your salt intake. Additionally, try eating several small meals throughout the day instead of three heavy meals. Add fibre to your diet if you are not getting enough and lessen its intake if you are getting too much. Fibre can be tricky when dealing with hypothyroidism; too much fibre, prevents nutrition from being absorbed and too little leaves waste and water weight gain in your body. Keep a healthy balance. Exercise and add some weight training to your workout to help boost your metabolism. Focus on being healthy, exercising, and especially keeping your daily eating habit in check and your body will keep your thyroid in check. What is the best diet for people with hypothyroidism? Hypothyroidism is a disease caused by an under active thyroid gland. What does that mean? It means the thyroid gland does not produce enough thyroid hormones. Fortunately, treatment can be relatively easy. Most patients with hypothyroidism need supplementation with synthetic or natural thyroid hormones. There are also beneficial changes patients can make to their diet to help them maintain good health, hormone balance, and in some cases help them lose weight or maintain a healthy weight. Since hypothyroid disease can often result in weight gain, it is important for people with hypothyroid disease to pay special attention to controlling their weight. Here are some specific tips to help you maintain good nutrition if you have hypothyroidism, whether your goals include hormone balance, weight loss or both. – Eat a diet that includes many whole grains and fruits, as well as vegetables. This basic diet plan is beneficial for anyone that has hypothyroidism. In addition you should try to consume lean proteins including fish and chicken while trying to avoid fattier meats. – Incorporate selenium into your diet. This is a trace mineral that helps the body convert thyroid hormone in the body. Specifically it assists with the conversion of T4 into T3 in the body. This trace mineral can be found in Brazil nuts, but you can also get it from eating some lean meats and eggs. – Consume more fibre, which helps with digestion, weight loss, and side effects of hypothyroidism including constipation. Eating a diet that includes lots of whole grains, fruits and vegetables is good because this helps you include natural fibre in your diet. Other good sources of fibre include beans and brown rice, quinoa, and other grains. Complex grains are always a smarter choice than refined grains including white bread or potatoes because refined grains do not have much fibre. – Try eating several small meals spread out throughout the day, which will help you stay full and help fire up your metabolism. Your blood sugar levels are also more likely to stay level if you consume several smaller meals throughout the day rather than three large meals during the day. These foods have a substance in them that may suppress the thyroid hormones enough to cause a condition known as goitre, so you should eat them sparingly. If you have hypothyroidism you don’t have to avoid them completely, you just don’t want to eat them as the main course of every meal. Some people with hypothyroid disease also benefit from a diet that is rich in iodine. You can find this in some foods including kelp. Iodine deficiency is not as common in developed countries as it is in underdeveloped countries, although people with underlying conditions including conditions affecting the body’s ability to absorb nutrients may need to supplement with iodine. Remember at all times to work with your health provider to develop a diet plan that is best for you. Eating well is a lifelong process. You may find over time your dietary needs change. You may be able to eat more or less of certain foods. This is normal. Make sure you keep a log of what you eat and how it makes you feel. This will help you refine your diet over time, so you can create the best possible diet for your body type. Hypothyroidism can be prevented if one eats healthy and does some exercise. If an individual suspects to be suffering from hypothyroidism, it would be best to consult a doctor for hypothyroidism to be treated properly. A hypothyroidism diet may be suggested since it can help the thyroid gland produce enough thyroid hormones. A hypothyroidism diet also includes multivitamins. If an individual has been diagnosed for hypothyroidism, it would be helpful to have a hypothyroidism diet. This is to make sure that one is not eating something that may complicate or worsen the hypothyroidism disorder. It is also best to have a hypothyroidism diet plan for an individual to follow through the list of food that one may eat to treat the hyperthyroidism disorder. For breakfast, one can start their day with dry food such as cereals and other fruits to have an energy boosting diet. As for lunch, since it is considered as one of the important parts of any hypothyroidism diet, a lunch meal should be anything that is rich in protein. This can provide the individual with important growth proteins to enable a higher rate of metabolism. To induce metabolism, an individual should eat poultry and fish products. Dinner is considered to be the most essential meal of the day. For an individual who is diagnosed to have hypothyroidism, a high protein diet will help enable a greater growth rate. Individuals that are diagnosed with hypothyroidism suffer from gaining excess weight or having difficulty in losing weight. Thyroid hormones are responsible for the metabolism in one’s body. When the thyroid gland fails to produce enough thyroid hormones, one can suffer from hypothyroidism. Common concerns for hypothyroid patients are rapid weight gain and difficulty in losing weight. One may stick to a strict diet but still gains weight or has difficulty in losing weight. If one suffers from hypothyroidism the body does not response normally with the calorie intake. Hypothyroidism makes the body store the fat since it no longer responds to sugar intake from the liver and intestines. One must seek medical help to be able to be provided with a proper treatment. Hypothyroidism may be treated with surgery and other medications. It is best to speak with a doctor first and avoid self medication to make sure that no complication may arise in the future. If one wants to use hypothyroidism diet pills to lose the weight that was gained because of hypothyroidism, it is strongly suggested to check first for any side effects as this may worsen the thyroid disorder and may also cause other complications if overlooked. Self medicating one’s thyroid disorder with hypothyroidism diet pills without proper information of the diet pill does not address the problem. One must be cautious enough to seek for a medical advice before taking any hypothyroidism diet pills. There is some controversy in the medical and naturopathic communities about whether or not diet can improve thyroid function and stimulate the production of thyroid hormones. Some people report improved thyroid health after eating or eliminating certain foods while others did not experience any change in thyroid function after altering their diets. The underlying cause of the thyroid malfunction may be the primary reason for such mixed results. For example, a hypothyroidism diet may not help a person who had thyroid surgery to remove part of the organ. However, some dietary changes may be beneficial in other ways. Cooking these foods (except for soy and millet) deactivates the goitrogens they contain. If you suffer from hypothyroidism, you can try cooking or eliminating these foods for awhile to see if your condition improves. You will want to avoid consuming caffeine as well. In addition to suppressing thyroid function, caffeine may cause thyroid cancer when consumed in combination with reduced iodine intake. Iodine deficiency can cause hypothyroidism, but so can over consumption of iodine for a couple of reasons. Iodine stimulates the immune system attack on the thyroid in patients with an autoimmune disorder. It also inhibits the action of TPO (thyroid peroxidises) which is an essential component to the production of thyroid hormones. Therefore, monitoring your iodine intake and keeping it at recommended daily allowances can improve your hypothyroidism. While your diet may or may not directly affect thyroid function, it certain can improve or worsen hypothyroidism symptoms. For instance, eating excessive amounts of sugar can cause irregularities in blood sugar levels and aggravate fatigue or hypersomnia (excessive sleeping). Eating a healthy diet and getting plenty of exercise can alleviate some hypothyroidism symptoms and improve your overall health. Eat fruits and vegetables – These foods contain lots of fibre and nutrients your body needs to stay healthy. Drink plenty of water – Water is essential for all bodily functions. To avoid compounding existing medical problems with dehydration, drink at least 8 cups of water per day. Use iodized salt – If you are suffering from iodine deficiency, this is a good way to get the recommended amounts of iodine on a daily basis. However, avoid over-consuming. Eating too much iodine can aggravate hypothyroidism. Avoid unhealthy fats – Saturated and Trans fats not only contribute to weight gain, they also clog your arteries and increase the risk for heart disease. Cook with healthy oils like olive oil and reduce your consumption of processed foods which often contain Trans fats. Opt for lean meats – Chicken, shellfish, and lean cuts of meat help you manage your weight better and contain B-vitamins that are necessary for good overall health. In addition to proper diet effective treatment is necessary. We looked at the different medications marketed for treatment of hypothyroidism and only found a few that we felt really got the job done. Hypothyroidism in Men is a disease where the thyroid gland is unable to produce the sufficient amount of hormones in which the human body requires. Major Symptoms of hypothyroidism include lack of energy, weight gain, sudden body temperature drops and constipation which is merely just a few of the symptoms related with hypothyroidism in men. Hypothyroidism in men can have many causes but problems associated with the thyroid gland are most common. Today, a very high percentage of men and woman suffer from this disease which has led researchers to develop many conventional medicines and also natural thyroid treatments aimed to help regulate the thyroid gland function. Although conventional medicines have been shown to keep the symptoms of hypothyroidism in men at bay they usually fail to cure the root issue of the disease which is why today many people have been turning to a natural thyroid treatment due to their effectiveness in not merely soothing the problem but eliminating it. Nonetheless both conventional and natural thyroid treatment have become readily available to the public but one very important aspect of combating the disease has continued to be ignored which is a healthy thyroid diet that must accompany the treatment. Whether you’re combating hypothyroidism in men conventionally or naturally it is always crucial to accompany your treatment with a diet geared towards assisting your body to heal. Fibre: Because of the rapid weight gain in which is brought on by hypothyroidism in man and woman, Fibre will be crucial in helping maintain a healthy body weight. Including Fibre in your diet will also allow you to combat constipation which is a usual symptom of hypothyroidism in men. Foods in which you might want to stock up on that are high in fibre include whole wheat bread, beans, green veggies, nuts and bananas. Iodine: Hypothyroidism in men and woman signifies low levels of iodine due to this it are wise to consume foods rich in this particular mineral. Foods which are high in iodine are readily available and can be easily found. Food to consume in which are high in this iodine include Seafood, Milk, Cheese, Apples, Beans and yogurt which are only a few of the foods high in iodine which can be found in your local supermarket. Selenium: This healthy mineral is very crucial in combating hypothyroidism in men and woman simply because it is a key player in allowing you thyroid to develop healthy thyroid hormones. Next time at the grocery store be sure to include selenium rich foods on your list. Foods high in Selenium include Wheat, Mushrooms, Seafood, Corn and chicken. Diagnosed and known hypothyroidism should be treated effectively (with normalization of TSH and freeT4) before becoming pregnant. During pregnancy, thyroid function should be monitored by an endocrinologist through repeated hormonal analysis. This is the only way to plan a normal, healthy pregnancy, without the risk of affecting the child’s intellectual or physical development. Endocrinology consultation and appropriate prophylactic treatment can prevent pathological situations and other consequences with a strong psychological impact on the mother, such as excess weight gain during and especially after pregnancy. • Your diet should consist of more of fruits and vegetables. Sometimes, pregnant women affected by hypothyroidism are advised to drink apple juice, grapes juice and watermelon juice first, every 3-4 hours in a day. After 5 days of drinking the juice, you can switch on milk. Then you can move to balanced meals rich in fruits and vegetables • Avoid carbohydrates, except those found in potatoes and grains. Avoid are cakes, cookies and other sweets rich in calories. • Walnuts are rich in iodine and magnesium, so they will help balance thyroid function. Kelp is a type of seaweed rich in iodine and it is often recommended for its beneficial effects on the proper functioning of the thyroid. Kelp can be used as a garnish for flavour soups and salads. • Regular consumption of coconut oil and milk is another remedy to rectify thyroid gland functions. Add two teaspoons of oil in a cup of milk. • People who have thyroid problems are advised to eat salads of cucumbers, carrots and Brussels salad. Cucumber is great for people who have goitre – caused by hypothyroidism. • Ginger Herbal teas are excellent for the proper functioning of the thyroid. Alcoholic beverages, soft drinks and coffee should be avoided. • Eat foods based on barley and oats to improve the functioning of the thyroid gland. Water consumption, cane and lotus stalk are also recommended. • Pregnant women suffering from hypothyroidism should consume foods that block thyroid’s gland over activity. These foods are: broccoli, cauliflower, cabbage and kale cabbage. • Recent research has shown that marine plants play an important role in balancing the endocrine gland functions. It turned out that phytoplankton plays a crucial role in this respect. A fast diet or crash diet means fasting over a few days with the goal of losing weight. During this period, the dieter severely limits his caloric intake. When on a fast diet, the person drinks water to prevent dehydration. However, the drastic reduction of caloric intake puts the body at risk. Some may consider this a good health plan with its rapid results. However, fast dieting has damaging effects. Rapid weight loss is often seen during a fast diet. While this may be perceived as a good outcome, the reality is that water and muscle mass along with the fat is being burned off. It is healthier to just eat the right amount of food and to have regular exercise when attempting to lose weight. Crash diets tend to cause hair loss or alopecia. This is because the body loses many essential vitamins and nutrients. Furthermore, a severe lack of essential nutrients can take its toll on the nails and skin as well. Experts all agree that this practice can also have damaging consequences on the heart, kidneys, liver, and brain. All the essential nutrients needed to maintain the integrity of these systems are deficient in crash dieting. Those who practice fast dieting in longer periods have also developed osteoporosis due to the deficiency in calcium levels. This condition may not manifest early on but can develop later on in life. Perhaps another issue that most fast dieters must face is the muscle tissue loss. Insufficient consumption of food does not just burn off the fat but the muscles as well. Insufficient energy is the most probable consequence of this as well as the retardation of the metabolic processes. Fast diets may seem like a quick and easy way out of an overweight situation. However, with the associated problems which may also include immunity compromises as well as organ failure, all health experts agree that this method of losing weight should be avoided. Weight gain is one of the most common symptoms of hypothyroidism. If your thyroid doesn’t produce enough hormones, the whole body slows down and losing weight becomes a struggle. The problem is aggravated by previous attempts to lose weight that reduced your slow metabolism even further. It’s a vicious circle of dieting, putting on weight again and starvation to stop any further weight gain. It is impossible to lose weight without bringing your thyroid back on line. The good thing is that if you mange to stick to thyroid diet you can lose weight easily. Any diet, even when you are healthy, will produce fall in metabolism. Your system goes into starvation mood and tries to protect the body by reducing thyroid output, so the fewer calories are being burned. That’s why the longer you diet; the more difficult is to lose weight. You can combine a hypothyroid diet with exercise but if your energy is low, any form of physical effort can be debilitating. This is especially true for hypothyroid patients. Low calorie diet is not the best option if your thyroid is low. Additionally, plenty of people are unable to process their food properly: processed carbohydrates are to blame for this. They are quickly digested and converted to glucose in a bloodstream. Insulin is being released to lower the sugar level, and glucose is converted to glycogen to be stored for the future use. When stores are full, the glucose is converted to fat. Refined carbohydrates such as: bread, cakes, pasta, soda, juices and sugar are being converted into body fat very easily. In fact you can lose weight just by limiting carbohydrates and without any calorie restriction. As opposite to refined carbohydrates, fats and proteins don’t cause weight gain if eaten in moderation. 1. Stop counting calories and don’t starve yourself. Any calorie restriction significantly lowers your metabolism. With the thyroid running low already, any reduction in calorie intake will cause further decline in thyroid function and eventually a weight gain. 2. Eat at least five or six small meals a day. 3. Limit your carbohydrates intake. Eat only complex carbohydrates like fruits and vegetables. Eliminate junk food, floury products and sugar from your diet. Proteins like nuts, beans, seeds, whole grains, omega 3 eggs, and poultry and fish burn slower than any other foods, keeping your hunger at bay for longer. Eating high quality proteins can help you to reduce fat from problem areas like hips and belly. 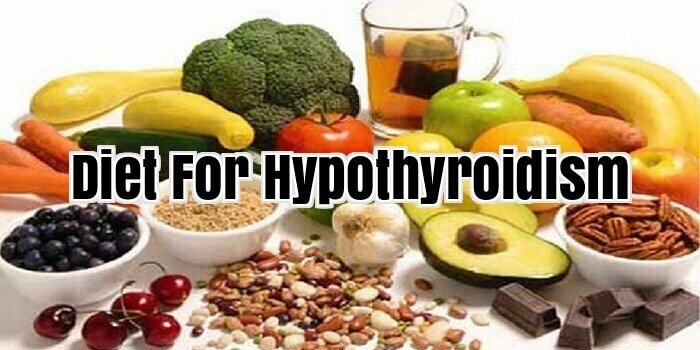 Foods For Hypothyroidism – What Should You Eat? Hypothyroidism is a condition that causes your thyroid gland to produce far less thyroid hormone than it should. This can result in a general slowing down of your metabolism, which can lead to lethargy, weight gain, and dry skin and hair lose. A common sign of hypothyroidism is protruding eyes. The reasons why your thyroid gland may be producing too little thyroid hormone are many and vast. However, you can control some of the symptoms with a hypothyroid diet or foods for hypothyroidism. This can completely cure thyroid problems in some people and can act as excellent adjuncts to doctor prescribed medications. If you have hypothyroidism, then there is definitely a hypothyroid diet you should be following. First of all, you need to include a lot of whole, organic foods for hypothyroidism in your diet. The more natural, healthy food you eat, the better. Fresh fruits, vegetables, and whole grains are important, as is lean protein. You should also eat seafood as this is a natural source of iodine, which is a trace mineral that is essential to proper thyroid function. If you don’t already take selenium, you should. This is also a trace mineral that helps your body convert inert thyroid hormones into their active forms. You can get selenium from supplements, lean meats, and Brazil nuts. The more fibre you eat, the better, as this will fill you up and help you to not overeat. As weight is an issue with hypothyroidism, the hypothyroidism diet should be one that strives to keep you feeling full without overeating. Taking in a significant amount of fibre, as well as a lot of pure, filtered water, will do this. Be sure to avoid sugar and white flour, because these can cause blood sugar fluctuations that can sabotage your weight loss plan. If you follow these foods for hypothyroidism suggestions carefully, you will find that you can often cure thyroid problems with little to no medical intervention. This is always the best option, as the medications that a doctor will prescribe to you will have side effects, and you will get much better results and feel better overall if you stick to a natural cure. If there are problems with thyroid function is low, you can adjust the diet food to support the healing of your low thyroid. Containing Vegetable fibres goitrogenik features important, vitamins, minerals and anti oxidants. Nutritious vegetables terlalul to be avoided, and then try eating vegetables once in a while me and try to cook in advance sayura to disable most of the compound goitrogenik. The vegetables should be avoided for example: Asparagus, Bamboo Shoots, Broccoli, Brussels Sprouts, Cauliflower, Corn, Kale, Kohlrabi, Radishes, Rutabaga, Sweet Potatoes, Turnips, Watercress, Wasabi seafood containing many chemicals There are some sea food support thyroid low because many contain plenty of iodine, but there are some types of seafood should be avoided because it contains concentrations of mercury and chemicals are too high. Seafood to avoid are shark, swordfish, tilefish and king mackerel may not be eaten as mercury concentration is too high, your thyroid gland toxicity. Limit consumption of tuna once a week. JUNK FOOD should be avoided if you have Hypothyroidism Junk food should be avoid because these food groups leads to inflammation in the body and inhibit the conversion of the thyroid hormone T4 into T3. The food groups are: processed foods, Deep Fried Foods, Foods Containing Sugar. The thyroid gland is an important organ that is located in the front part of your neck. The gland produces hormones that control metabolism in the body. Hypothyroidism or low thyroid disorder is mainly caused by iodine deficiency. You can help your thyroid function properly by making some adjustments to your diet plan. There are some foods that could hinder the gland from working properly or even aggravates thyroid problems. Eliminate or reduce the intake of these foods from your diet. Gluten is found in wheat, barley and rye. Research has shown that gluten inhibits work of the thyroid gland. It is advisable to remove foods that contain gluten from your diet. However, it is not easy to eliminate gluten as it is contained in many foods. Consult your doctor before removing gluten from your diet. Studies have shown that fish contains high concentration of mercury which can damage the thyroid gland. Fish also absorb their wastes, chemicals and antibiotics from the water. These chemicals poison thyroid gland and worsen the effects of hypothyroidism in the body. Many people with hypothyroidism are allergic or sensitive to dairy products. It is advisable to eliminate dairy products from your diet completely or reduce intake. Tea contains fluoride which is toxic. Avoid both black and green tea for a few months and observe results. Eliminate or lower intakes of non-fermented soy foods as they contain Phytoestrogen. Phytoestrogen is known to hinder thyroid function. Research has shown that caffeine blocks the absorption of thyroid hormone in the body. Doctors advise hypothyroidism patients to avoid caffeine while on medication. If you have to take coffee, drink it 30 minutes after medication. Eliminate or reduce intake of fatty foods such as margarine, meat and butter. This is because fats inhibit absorption of thyroid hormone replacement tablets. Millet contains flavonoids that reduce intake of iodine into thyroid hormone. They also inhibit transport of thyroid hormones by proteins in the body. This worsens your thyroid condition and increases the negative effects of hypothyroidism on your body. Due to these reasons, you should omit it from your diet completely. Avoid intake of soft drinks. Sodas and juices contain fluoridated water. Fluoride has been known to increase thyroid disorders in the world. Broccoli and cabbages are examples of cruciferous vegetables. You should reduce intake these vegetables because their absorption limits the absorption of iodine by the thyroid gland. They also interfere with production of thyroid hormone. However, cooking these vegetables can reduce their effect on the thyroid gland. In fact, food supplements are type of nutritional supplements that are traditionally made from whole food concentrates. You have to remember that the typical American diet lacks nutrients. As well, there could be commercial dietary supplements. But, as a rule these are artificially synthesized or extracted chemically. In that case, such supplements could still cause nutritional deficit. At the same time, whole food supplements are made of whole food concentrates. In addition, the process involved into making whole food supplements does not use heat, making it preserve vitamins and other nutrients much better. Whole food supplements are considered to be the best way to complete the nutritional needs for vitamins. Vitamins are necessary for nutritional support and healing as well as provide a number of co-factors and phyto nutrients. Coming from concentrated food sources like grains, vegetables, fruits and nuts. Whole food supplements offer well balanced and complete nutrition with the added benefits of alkaloids like polyphenols and carotenoids along with plant based amino acids which are needed for proper absorption and use of nutritional supplements. There are almost thousands of phyto chemicals beneficial to the human body that are not found in traditional chemically prepared vitamins that are present in their natural state in whole food supplements. The best choice for complete nutritional vitamin supplements is provided by the whole food supplements. You have to remember that vitamins are not acting in isolation, even if they could be vital in the diet. The fact is, aside from the nutritional supplements, co-factors and phyto nutrients are provided by whole food supplements as well. The main reason why whole food supplements could provide you with complete and well balanced nutrition is since it comes from nuts, beans, fruits, vegetables and grains. In that case, you can enjoy the benefits of polyphenols and carotenoids in addition to the plant based amino acids. In fact, these acids help in the absorption and use of nutritional vitamin supplements. Phyto chemicals that benefit your health could be synthetically made; however, whole food supplements keep them in their natural condition. Besides, mineral supplements could be also provided by the whole food supplements. You have to remember that such minerals as iron, calcium, copper and magnesium are needed by the human body because they help you prevent deficiency diseases. In that case, mineral supplements that are commercially manufactured uses chemically prepared minerals which are insoluble to the human body. The main advantage of whole food supplements is that they give you all those minerals in a preserved natural state, which is made from the whole foods. And thus mineral support and deficiency disease prevention could be gained from high quality and natural supplements. In addition, whole food supplements could act as herbal supplements. The majority of commercial herbal supplements use heat extraction process, which destroys active components. However, the whole food supplements retain the form of active components because they use natural whole food processes.